To Cite: Pazouki A, Jesmi F, Alibeigi P, Abdolhosseini M, Nikoyan P. Laparoscopic Resection of Ileum Diverticulitis: A Case Report, J Minim Invasive Surg Sci. 2016 ; 5(3):e40457. doi: 10.17795/minsurgery-40457. Introduction: Ileal diverticulum is a rare disease that presents with complications such as diverticulitis. Case Presentation: We present an 81-year-old man with partial small bowel obstruction having abdominal pain, nausea, vomiting for 48 hours and a mobile abdominal mass. After CT scan, exploratory laparoscopy and small bowel resection was done with primary anastomosis. Conclusions: When adhesion, internal hernia and malignancy are ruled out in patient presenting with partial obstruction and abdominal mass, other causes like diverticula must be considered. Ileal diverticulum is a rare disease in adults and has been detected in 1% of small bowel of gastrointestinal imagings (1, 2). About 6% - 10% of patients with small bowel diverticulum may have acute complications such as hemorrhage, abscess, small bowel obstruction, perforation, fistula formation, and anemia as a result of mal absorption (1, 3-5). Pathophysiology of diverticula formation is not clear. However some have introduced a motor dysfunction of smooth muscle or mesenteric plexus in small bowl, which increases the intestinal pressure and herniated mucosa and sub mucosa through the areas of low resistance, at the point of vascular penetration (3, 6). Despite meckel’s diverticulum, ileal diverticulum is not hereditary and exists all around the world. It is a pseudo-diverticulum, in which not all small bowel layers are herniated; mostly mucosa and sub mucosa are herniated through the site of blood vessel penetration and located at the mesenteric side of small bowel. It is mostly seen in sixth and seventh decade of life and is more prominent in men (1, 3, 5). Clinical symptom and laboratory tests are not specific and diagnosis is usually difficult. Moreover, it has usually no specific finding in abdominal X-ray when diverticulum is not complicated, but ultrasound and CT scan can help us to diagnose it (1, 7). Therefore, it could be very important to consider this uncommon differential diagnosis of patients with obstruction. Because, despite of its low prevalence complications, it may be life threatening (1, 4). An 81-year-old man referred to Hazrat Rasul Akram hospital with abdominal discomfort, nausea and vomiting from two days ago. He was admitted and treated with bowel rest and serum supplementation, but he did not respond to conservative therapy. In his past medical history, he had been treated medically (conservative management) for small bowel obstruction 2 years ago. His past surgical history was open appendectomy and laparoscopic inguinal hernia repair with transabdominal pre-peritoneal method (TAPP). On physical examination, he had soft abdomen, no tenderness or rebound and a mobile palpable mass was detected in right upper quadrant (RUQ) of abdomen. His blood pressure was 130/90 mmHg, pulse rate was 90/min, respiratory rate was 18/min, and oral temperature was 37.2°C. His laboratory blood tests were within normal range: white blood cell = 6700 µg/dL, with 64% polymorphonuclear, hemoglobin = 12.4 g/dL, prothrombin time = 13 sec, partial thrombin time = 35 sec, sodium = 137 mEq/L, potassium = 4.2 mEq/L, blood urine nitogen = 21 mg/dL, creatinin = 0.8 mg/dL, calcium = 9.5 mEq/L. Abdominal X ray showed two air fluid levels. Ultrasound revealed full fluid bowel loop and no free fluid in abdominal cavity. Computer tomography (CT) scan showed a well regular solid mass of 10 × 13 centimeters located in the RUQ of abdomen, which was suspected (due to radiologist report) to originate from small bowel without connection to bladder. 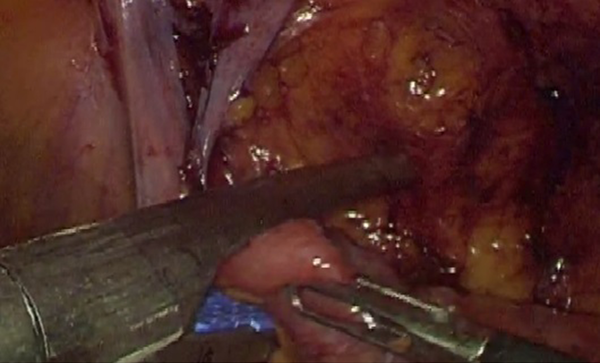 During diagnostic laparoscopy, significant amount of adhesion was seen in the right side of abdomen; in addition to a large mass in terminal ileum about 20 cm to ileocecal valve (Figure 1). Laparoscopic adhesiolysis was done and after full recognition of anatomy, it seemed to be small bowel diverticula, but completely solid. Then, small bowel resection was done with 5cm margin from each side with linear 60 mm blue echelon staples in small bowel site. Side-to-side anastomosis was done with one 60mm blue stapler and the stab was closed with PDS 2/0. In postoperation period, the patient had no problem and had bowel movement after 3 days and was discharged from hospital on day 4. The patient was completely free from constipation in first and third and sixth month after surgery. Pathology findings revealed multiple diverticulums with some degrees of inflammation in lamina properia. We obtained informed consent from the patient who enrolled in our study. Diverticulum of small bowel (except the Mecklel diverticulum) is found in duodenum more frequently than in ileum (8). They are multiple and asymptomatic, but have some life threatening complications (1, 3). Previous small bowel resection, trauma and crohn’s disease have been reported to be predisposing factors for ileal acquired diverticulum (6). In our case, the patient had also a history of appendectomy and laparoscopic bilateral herniorrhaphy which was a predisposing factor for diverticulitis. Clinical symptoms and laboratory test are not specific and diagnosis is usually difficult by them (3). The patients usually refer with partial obstruction and abdominal mass, as in our case. The laboratory tests are also mostly nonspecific, except in cases of complications, such as elevated ESR or WBC in perforated small bowel or imbalanced electrolytes due to obstruction (7). But our case had a partial obstruction and no abnormal laboratory findings. Our patient was also candidate for surgery as quick as possible to prevent any complication. However, imaging findings can be very helpful. Although ultrasound is often requested by the clinicians as the initial examination in a patient presenting symptom of an acute abdomen, CT scan should be considered as the first choice in the evaluation of abdominal pain (2, 5). CT imaging shows the presence of: 1) heterogeneous mass with air or fluid level, which appeared to be related to ileum along the mesenteric border, 2) uncomplicated diverticula elsewhere in the small bowel, 3) inflammation of mesenteric fat or dilated small bowel loop with thickened and enhanced wall (5). But our case had insignificant findings in ultrasound and CT scan (only a mass in RUQ and minor small bowel distention) and was therefore candidate for diagnostic laparoscopy. In laparoscopic investigation, the mass was detected and completely removed without any intra- and post operational complications. The authors suggest that in cases of partial obstructions and abdominal mass, laparoscopy can be a very helpful diagnostic procedure, which can also prevent an invasive laparotomy and also treat the disease. On the other hand, laparoscopy has less pain and faster return to normal life for the patient. Therefore, all educational centers with enough equipment are recommended to perform laparoscopy procedure as soon as possible in the cases, in which the imaging tests are insignificant, in order to prevent fatal complications. Although CT scan is the diagnostic test for these diseases, some cases may need diagnostic laparoscopy for specific diagnosis, which can be used also for termination of the disease. We would like to express our special thanks from the patient participated in this study and all personnel of the minimally invasive surgery research center. Authors’ Contribution: Study concept and design: Abdolreza Pazouki, Payam Nikoyan; acquisition of data: Payam Nikoyan; analysis and interpretation of data: Payam Nikoyan, Peyman Alibeigi, Mohammadreza Abdolhosseini; drafting of the manuscript: Fatemeh Jesmi, Payam Nikoyan; critical revision of the manuscript for important intellectual content: Abdolreza Pazouki, Peyman Alibeigi, Mohammadreza Abdolhosseini; statistical analysis: -; administrative, technical, and material support: Abdolreza Pazouki; study supervision: Abdolreza Pazouki.